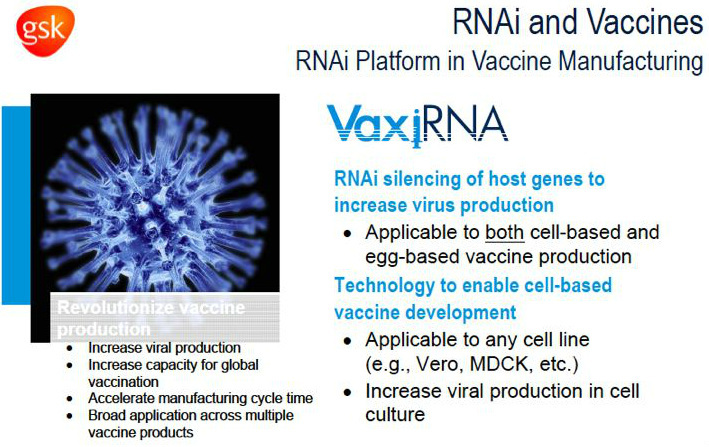 RNAi therapeutic being developed for respiratory syncytial virus infection (click for scientific article). 5/2/11 Question: Why do the interim look? We had always wanted to do an interim look. We recently completed discussions about this w/ FDA. This trial is based on a very small p2a study (~25pts), want to reproduce those data w/ more robustness. CEO did not answer whether there is alpha burn for the interim. 5/2/11 question: What would size of p3 RSV trial be? This is life-threatening complication w/ 50% mortality...which could affect FDA's desired study size...There is some small chance this study is sufficient for filing, but FDA may well want data reproduced in similar sized study...current one is largest p2b ever among this transplant patient population. Partnered w/ Cubist 1/2009 for RSV01 and several 2nd generation backups, $20m upfront [$1m paid to ISIS] and up to $82.5m milestones, plus double digit royalties (equal split in NA). Jointly develop in North America, CBST does ROW except Asia. ALNY is developing at own risk and expense for lung transplant, CBST has right to opt in to this program for a specified period of time after completion of p2b by paying an undisclosed, prespecified % of pgm costs. Can convert NA to same royalty model and get up to $130m more milestones. 6/2008 Partnered with Kyowa Hakko Kirin for RSV in Japan/Asia for RSV01 and all other RSV directed programs, $15m upfront and up to $78m milestones, plus royalties, KHK pays for development, focus first on Japan, can terminate on 180 days notice). 2/2008 reported positive RDBPC GEMINI p2 data in 88 (1:1) adults experimentally infected w/ RSV- safe and well tolerated, 40% decrease in viral infection rate and 95% increase in RSV-free pts vs placebo. Utilizes 1st generation LNP formulation and being developed for primary (700k per yr worldwide) and secondary (500k per yr) liver cancer (at best is 20% 5 yr survival if detected early-represents 15% of total, most=fatal in 3-6 months). First systemically delivered RNAi to enter clinic. 3/2009 initiated multicenter open label p1 trial in up to 55pts with advanced cancers with liver involvement. Interim data 2010 and 2011 shows was generally well tolerated and signs of biological activity. 5/2/11: enrollment completed 4/2011, with multiple pts still receiving therapy. 6/2010 data showed anti-VEGF activity in pt tumor samples. 1/2011 data showed detection of siRNA in nearly all tumor tissues at pharmacologically relevant concentrations. 6/2011 at ASCO: presented phase 1 data. 41 pts received 182 doses ranging from 0.1 to 1.5 mg/kg. Multiple pts achieved SD or better (12 of 24 SD at 0.7 or higher doses, one ongoing PR). Adverse evens included fever, fatigue, and nausea in 25-25% of pts, no dose dependent changes in liver function tests. One liver failure leading to death ruled "possibly drug related." Recommend 1.0 mg/kg every two weeks as phase 2 dose. also measured siRNA presence in nearly all tumor biopsies taken, at concentrations that lead to meaningful gene silencing in preclinical studies. Click here for PR. Plan to partner before p2 trials (6/2011 - goal to initiate in 2012).